Extreame Savings Item! Free Shipping Included! 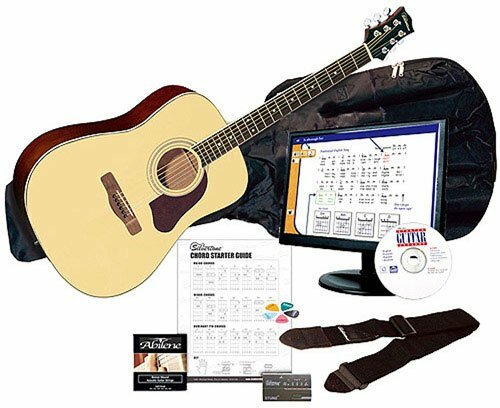 Save 50% on the Silvertone SD3000 Complete Acoustic Guitar Package with Instructional Software, Natural by Silvertone at Debbie Dee Music. MPN: SD3000 EPN. Hurry! Limited time offer. Offer valid only while supplies last. Easy-to-follow lessons for this Silvertone SD3000 Acoustic Guitar range from basics like stringing the guitar to playing chords and strumming techniques.Any guitar whether it be electric or acoustic, the neck can be adjusted with the included truss rod tool to increase the height of the strings to prevent buzzing. If you have any questions about this product by Silvertone, contact us by completing and submitting the form below. If you are looking for a specif part number, please include it with your message.